While I was in Maine for Memorial Day weekend I managed to get away early one morning, on Memorial Day itself, to check out Scarborough Marsh, mere minutes from where we were staying in South Portland. It was a cold, wet morning and though I gradually built up a decent list of birds it was not easy, especially considering I had never birded at the famed saltmarsh and didn’t really know the best spots to search. Nonetheless, I was having a pretty good time and my list eventually had almost fifty species on it. 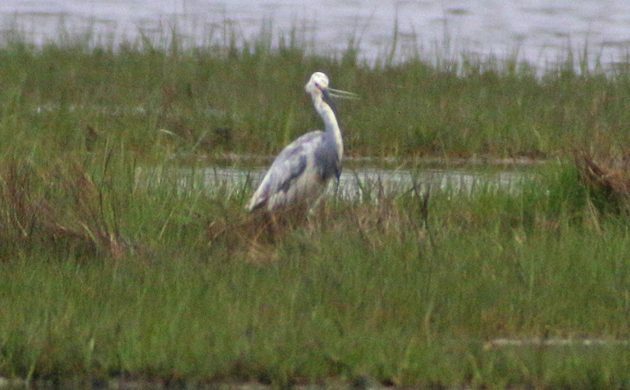 Then, scoping from the end of Seavey’s Landing Road, I spotted an egret. It was like no egret that I had seen before. Mostly white, it was about the size of a Snowy Egret but with a bill that was a bit too long, patches of grayish-blue plumage on the neck, back and wings, and two long head plumes. I was really hoping this was a Little Egret which would be a first in North America for me, but the patchwork plumage was really throwing me. 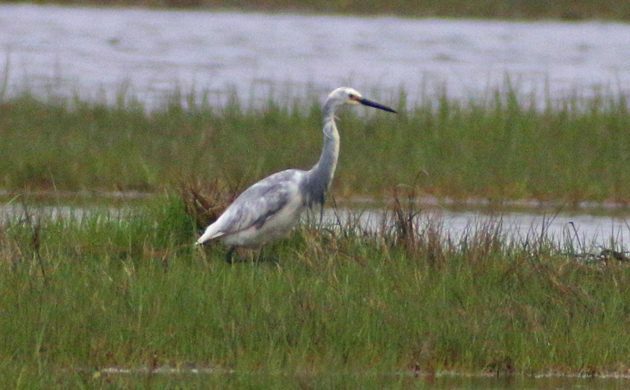 The yellow lores worked for a Little Egret in breeding plumage but I couldn’t figure out why, it was a Little Egret, it wouldn’t be an all white bird. I digiscoped up a storm and shared some back-of-camera images via text message and on Facebook. I spent a long time watching this bird, getting images, and getting video. Suggestions started to come in via text and Facebook. A Little Egret, a Western Reef Heron, a hybrid between those two, and, from Zach Schwartz-Weinstein, a hybrid Snowy Egret X Tricolored Heron. 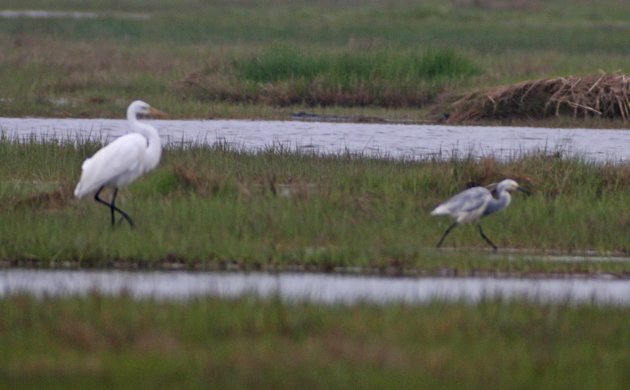 I stuck with the bird, gradually getting a better feel for it, and soon realized that it lacked the yellow feet one would expect on a Little Egret. All black feet and legs? What was this bird? The bill is way too long for a weird Snowy Egret, the all black feet rule out several species, and that patchwork plumage is bizarre. 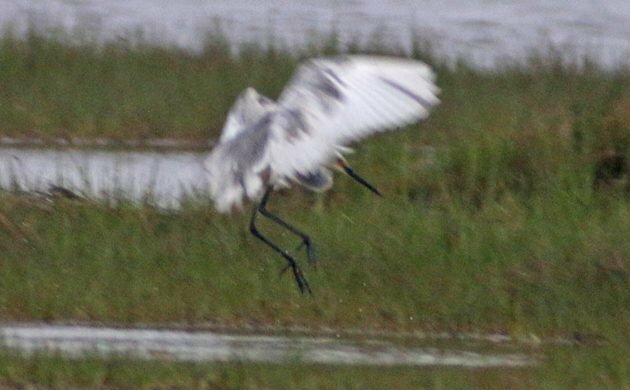 Way out of focus on this shot but the direct comparison with the Great Egret should give you an idea as to the bird’s size. Now, if you’ve read the headline of this post you already know that Zach was right and it is a Snowy Egret X Tricolored Heron. I learned this because Tom Johnson – the man, the myth, the legend – showed up on my Facebook page and let me and those speculating about the bird that there is at least one and perhaps several of this hybrid that have been haunting Scarborough Marsh. They are well known to the locals. Sorry for the shaky video with lots of wind noise. At least it’s a video! What about you? Have you ever spent an inordinate amount of time on a bird only to discover it was something that you wish you hadn’t spent such time on? Do share in the comments! Why is it not a hybrid Litte x Western Reef? Does Tricoloured have two head plumes? If this bird showed up in Spain, where hybrids are frequent, it would blend in perfectly. first: I added little blue moulting to adult, bill and legs wrong but could be environmental coloring… nope! time spent that I want back: World’s largest streaky sparrow… AKA Female Red Wing Blackbird. I once followed a strange bird call through a forest near Ulm/Germany for probably an hour or so only to find it was an escape parakeet of some kind. Many miles away from the nearest settlement. Actially, no. If I wind up spending a long time on an individual bird to which I am trying to put a name, place in a known box, and finally come up with the correct moniker, I am quite happy. Happy, because I’ve learned something that I hadn’t previously known. Hybrid birds are always great teaching tools, as they force me to recall a much-wider set of characters about specific potential parent species than I would normally use to actually identify an individual of that potential parent species. Spending time actually studying an individual bird, whether a one-off hybrid or the 2,469th individual that one has seen of a particular species is never wasted. It all goes in the memory banks and is, hopefully, available in future ID endeavors. Conversely, simply recognizing that an individual bird belongs to a particular species and moving on provides little or no data for future ID endeavors. Sit back and smell the roses… and study the plumage and various aspects of shape of the next female Red-winged Blackbird. Can you age it? (It’s not tricky.). Can you learn one or two aspects of its appearance that will permit accurate ID of a leucistic female Red-winged, or one that is oiled, or…?